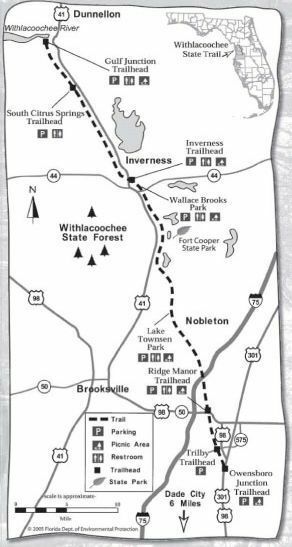 The long awaited three mile extension of the Withlacoochee State Trail is still slated to open in March as planned. The latest addition to the trail begins just south of Dunnellon, near a Sunoco gas station and ends in Marion County, off West Bridges Street near the Rainbow River Club. It includes a new pedestrian and bicycle bridge over the Withlacoochee River. The existing trail meanders northward through three counties, Pasco, Hernando and Citrus and has been described by cyclists as “long, scenic and safe.” The new section represents the next step in connecting a big network of popular trails across Florida. Parts of the Heart of Florida bike loop route, along with other trails from the Everglades to the Panhandle, have been designated the Florida National Scenic trail by Congress, according to the U.S. Forest Service. It is part of several such trails across the U.S. such as the Appalachian Trail from Maine to Georgia. Following an official ribbon cutting ceremony for the newest trail section, opening from the south will be only off U.S. 41, branch easterly on Citrus County Road 39, opposite the Sunoco Station, south of Dunnellon. From the north, off C.R. 484, branch south onto San Jose Blvd. to a track opening past the Rainbow River Club.